The first points are about to go on the board at men’s NCAAs, with the first night’s finals session set to launch in Iowa City. 6 total events will be contested tonight, with several American, NCAA and US Open records hanging in the balance. On red alert is the 200 IM record, where Stanford’s David Nolan will look to further lower the mark he set at Pac-12s. Nolan is actually just the second seed, though, after Texas sophomore Will Licon crushed a huge prelims swim. Texas sophomores swimming fast was a theme this morning. One event before the 200 IM, Clark Smith smashed through the 500 free for the top seed; he leads defending champ Cristian Quintero of USC. 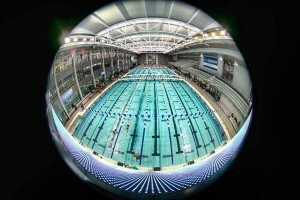 And don’t forget the 50 free, the flashiest of races, which will close out the individual swims of the night. Florida freshman Caeleb Dressel leads the way, but Alabama’s Kristian Gkolomeev is still likely the favorite, holding the nation’s top time at 18.64 from the conference rounds. We’ll also contest the 200 free relay, where NC State has a shot to become one of the first teams outside of the NCAA’s “traditional” powers to win a relay in a long, long time. They’re the top seed after narrowly averting a relay DQ this morning. Also competing will be 1-meter diving, plus the 400 medley relay, where Cal is the top seed and looks to repeat its 2014 title. Meanwhile, keep an eye on the team points race, where we’ve got a potential four-team battle on our hands. Texas is projected to take the lead tonight, but defending champs Cal are close behind, and Michigan and Florida are still in the hunt as well. A thunderous battle in the 200 free relay kicked off what should be a high-octane session. In one of the most drama-filled events of the whole season, NC State managed to swim away from the rest of the nation over the final 50 yards, only to have their relay disqualified for a false start on the final leg. That especially hurts for the Wolfpack considering they were originally DQ’d for a false start in prelims, then reinstated after an appeal. Further clouding matters was that NC State also DQ’d this relay last season – that makes two years in a row that the Wolfpack disqualified a relay with genuine national championship potential. It also wipes out an 18.2 split by anchor David Williams that would have sealed the win, though that was the relay exchange the team was disqualified on. That left Texas suddenly in the driver’s seat, and the Longhorns will start their run towards a possible team title with a points lead. 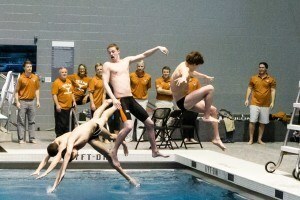 The Longhorns were 1:15.86, about seven tenths back of the disqualified NC State crew. Texas got three straight 18-second splits to close the event, courtesy of John Murray (18.85), Jack Conger (18.75) and Kip Darmody (18.93). Matt Ellis led the team off in 19.33. Perhaps their biggest rivals in the team hunt are Cal, and the Bears were second overall in 1:16.02. Cal had a wicked 18.68 out of anchor Ryan Murphy, plus an 18.82 from Seth Stubblefield. Tyler Messerschmidt led off in 19.23 – that’s .16 off his individual prelims swim. Messerschmidt will compete in the A final of the 50 free later on tonight. Auburn took third, going 1:16.04 and nearly holding off Cal for the win. Kyle Darmody was 18.72 on his anchor leg, and the Tigers also got an 18.78 from freshman Jacob Molacek and an 18.96 from Michael Duderstadt. Alabama led things early, with standout Kristian Gkolomeev leading off in 18.98. Though the rest of their splits were 19-low, it wasn’t enough to keep the top three teams at bay. An 18.74 split from Dylan Carter powered USC to fifth place in 1:16.55, just a hundredth back of ‘Bama. Meanwhile Missouri was 6th in 1:17.16, with Michael Chadwick dipping below 19 – he was 18.90 on the third split. The last team in the A final, moving up to 7th with the DQ, was Michigan. Bruno Ortiz was 18.94 and the Wolverines went 1:17.23. The B final was a heated battle between Arizona and Florida, each boasting one of the nation’s best individual 50 freestylers. ‘Zona took home the heat in in 1:17.34, though star leadoff man Brad Tandy was just 19.24, despite throwing down an 18.9 in last year’s individual event. Florida was .01 behind as a team, going 1:17.35 and getting an 18.66 from Dressel. The other big implication of that NC State DQ is that it ultimately helps Texas in their team battle against Cal. The two programs were originally 2nd and 3rd, and set to earn 34 and 32 points, respectively. But with Texas moving to first, they get the winning bonus points and earn 40, while Cal only moves up to 34. In a meet that could come down to the wire, what is essentially a 4-point swing could turn out to be big in the team race. Wallace settled for second, touching in 4:10.48. USC’s sophomore Reed Malone swam a patient race, watching Quintero go out fast on one side of him, then watching Wallace surge on the other side, but ultimately kept the blinders on and touched third overall in 4:11.94. Michigan’s Anders Nielsen had a big drop from his 8th-place prelims performance, going 4:12.16 for fourth. The defending champ Quintero dropped off after his big first 100, taking 5th in 4:13.21. Florida’s other finalist was Mitch D’Arrigo, who went 4:14.30 for 6th. Things dropped off somewhat from there. Texas’s big prelims surprise Sam Lewis faded to 4:16.75, and his teammate Jon Roberts was just 4:16.89 to round out the A heat. The consolation final went to Georgia’s Matias Koski in 4:11.83, a big statement swim from a guy who was no doubt disappointed to miss the A final this morning. That was a big event for Texas in the team race, as the Longhorns now lead with 83. USC is second at 58 and Florida sits third in 45. Michigan is fourth (39) and Cal dropped all the way to 5th with just the 34 from their medley relay (the Bears had no scorers here). One of the most-anticipated events of the night, the 200 IM did not disappoint. Stanford senior Dave Nolan cranked out the finest 200 IM ever swum. The versatile Cardinal, whom we ranked as the most valuable swimmer to his team in all of college swimming, absolutely crushed his own American record, going 1:39.38 for the win. That’s the first time anyone has broken 1:40 in the event in history – for reference, Olympic hero Michael Phelps swam the race earlier this month and was just 1:40.84. Nolan went after the race hard, tying Texas sophomore Will Licon for the fastest fly split at 21.67. 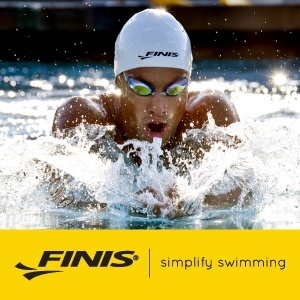 But the Cardinal took over the lead in his specialty, backstroke, splitting 24.32. From there, it was all Nolan as the IMer held his lead on breast (29.21) and then extended his lead with a 24.18 on free, the best closing leg of the field. For his part, Licon nearly went under the old American record as well. His 1:40.09 will stand as the third-fastest 200 IM history behind Nolan’s two swims (Nolan’s old record was 1:40.07). Licon had the field’s best breaststroke split at 28.75. Cal’s Josh Prenot took third, finishing way farther behind the leaders than a 1:41.79 has ever been. Prenot boasted one of the field’s best breaststroke splits at 29.18. Stanford made it a big event, also taking 4th with Tom Kremer‘s 1:42.43. He just touched out Cal’s star backstroker Ryan Murphy, who was 1:42.49, oustplitting everyone but Nolan with a 24.87 on the backstroke. Michigan’s butterfly star Dylan Bosch was sixth, going 1:42.62 – he’ll try to defend his 200 fly title on Saturday for the Wolverines. Also in the A final were Florida’s Eduardo Solaeche (1:42.96) and Georgia freshman Gunnar Bentz (1:43.00). Texas won its third heat out of 6 so far on the night as freshman Joseph Schooling went 1:42.86 to power away with the B final. Arizona’s Brad Tandy rocked his typical fast start from lane 1, and looked like he’d have a shot to repeat as a title winner. But in the middle of the pool, Florida’s Caeleb Dressel and Alabama’s Kristian Gkolomeev surged out of the turn, with Dressel using his big-time underwaters and Gkolomeev electing to pop up early and swim on top of the water. At the wall, it was Dressel, who hit a new 17-18 National Age Group record for the third time today with a big-time 18.67. 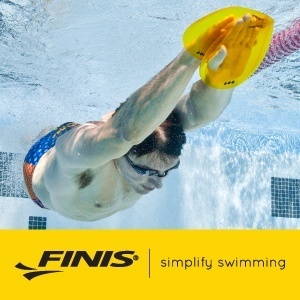 Not only was that a new NAG record, it nearly broke the American record set by Olympian Nathan Adrian back in 2011. Dressel was just .01 off that mark. Gkolomeev settled for second, unable to repeat his SEC Championship performance and going 18.74 – Gkolomeev, who tied Tandy for the win last year, was exactly one tenth off his SEC time, which would have won a national title here. 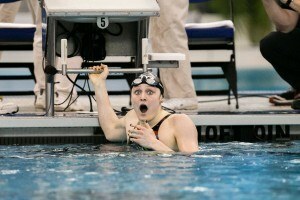 For the second-straight year, Tandy tied another swimmer in this event. 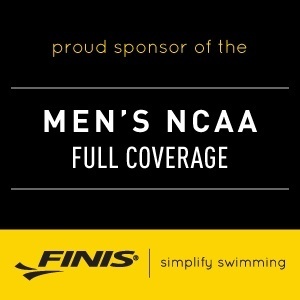 The Arizona Wildcat senior was 18.91, tying NC State’s Simonas Bilis. That’s some redemption for Bilis, a new lifetime-best after the junior saw his NCAA title-winning relay disqualified earlier in the night. Georgia Tech senior Andrew Kosic went 19.18 for 5th, touching out Cal’s Tyler Messerschmidt (19.19). Michigan took the final two spots in the championship heat, with senior Bruno Ortiz going 19.32 and freshman Paul Powers 19.44. Missouri’s Michael Chadwick touched out Auburn’s Kyle Darmody to win the B final, 19.27 to 19.33. With no Texas Longhorns in that event, Cal made up some ground, but Texas still leads the way with 109 points. California has 85, and Florida’s Dressel-boosted score sits at 84. This is the point where the top 4 are starting to separate themselves, as Michigan has 75 for fourth, but USC is back at 59 in fifth place. Cal stormed to the lead early, with sophomore Ryan Murphy breaking the NCAA record with a 44.17 backstroke split on the way out. 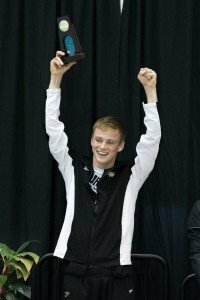 He handed off to breaststroker Chuck Katis, who was equally impressive – Katis split 50.12 on his leg, beating even reigning American record-holder Kevin Cordes of Arizona. Michigan took fourth, putting up a 3:05.18 to nip Auburn’s 3:05.38. Michigan had a 51.21 from breaststroker Richard Funk, plus a 41.84 on anchor Bruno Ortiz, who has had a busy first day. Auburn was also fast on those two legs, with Michael Duderstadt matching Funk’s 51.21 exactly and Kyle Darmody anchored in 41.86. With one day in the books, Texas has built up a pretty solid lead over Cal in the team standings, with Florida and Michigan hanging in just behind. The Longhorns, after sweeping the two day 1 relays for the first time since 1990, hold a lead at 171, with Cal second at 119. Florida’s 108 and Michigan’s 105 round out a top 4 that seem to be establishing their dominance. Oh how I love championship season… Almost better than Christmas! Finals start at 8pm EST. Iowa is in the Central Time zone so they are one hour behind us.